"From Fort Dix to Korea"
So, what's with this family? It’s exciting to bring you this facsimile edition of Windmill Weights. 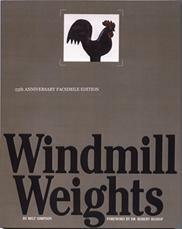 When the book was first published in 1985, it was promoted as,“The book no one has been waiting for.” Very few people at that time were aware of what windmill weights were. Word spread and many national publications wrote about the subject. Prices climbed. The book sold out quickly and became a classic. That’s the reason for this publication. It’s a book that has been appreciated by folk art collectors, antique collectors and dealers, graphic designers, history and photography buffs, interior designers and farm implement enthusiasts. I hope you enjoy it. Born and raised in New York City, I attended the New York School of Industrial Art (SIA), now the School of Art and Design. I then worked for Incorporated Ideas Advertising Agency in New Jersey until I worked for the United States Army, even checking out Korea. After my discharge from the Army, I attended The Workshop School of Advertising & Editorial Art. Upon completion of my studies there, I became the Art Director of The American Baby Magazine in New York, Assistant Art Director at Lewin, Williams & Saylor in New Jersey, and then Art Director of Kenyon-Baker Advertising & Baker Printing Company, both of which were under one roof in New Jersey. (I left there because the promised air conditioner was never installed!) I was then a freelance graphic designer and illustrator for several years. In 1964, Don Johnson and I founded the firm of Johnson & Simpson Graphic Designers with me as president. We were based in our townhouse in beautiful downtown Newark. We specialized in corporate communications. The design projects included annual reports, corporate magazines, capability brochures, posters, museum catalogs, trademarks and BOOKS. I wrote “Windmill Weights” which was self-published and “Folk Erotica” published by HarperCollins. The firm was featured in every major design publication, was recognized by over 350 graphic design awards and Don and I were inducted into the New Jersey Ad Club’s Advertising Hall of Fame in 1991. I also served on the Advisory Board of The Greater Newark Chamber of Commerce and was an Adjunct Professor (Publication Design) at Montclair State College. The New Jersey Art Directors Club even voted me Art Director of the Year in 1972. But BOOKS are still my passion. I can’t seem to get them out of my system and don’t try to. I’ve always been a student and appreciator of quirky, eccentric and irrational human behavior. Currently, I am producing Artists’ Books using several print-on-demand companies. These Artists’ Books are very much influenced by my observations and obsessions.